What if, instead of succumbing to your turkey stupor, some sort of chest-mounted robot arm could lob sweet treats into your open mouth? Arm-A-Dine is actually a prototype designed to augment the social experience of eating. For those celebrating Thanksgiving, at some point there will come a time where you is simply too full to move. At this point, the sensible action is to sleep it off before rising later in the day, groggy and disorientated, for a second gorging. But what if technology could help? What if, instead of succumbing to your turkey stupor, some sort of chest-mounted robot arm could lob sweet treats into your open mouth? What a world that would be. 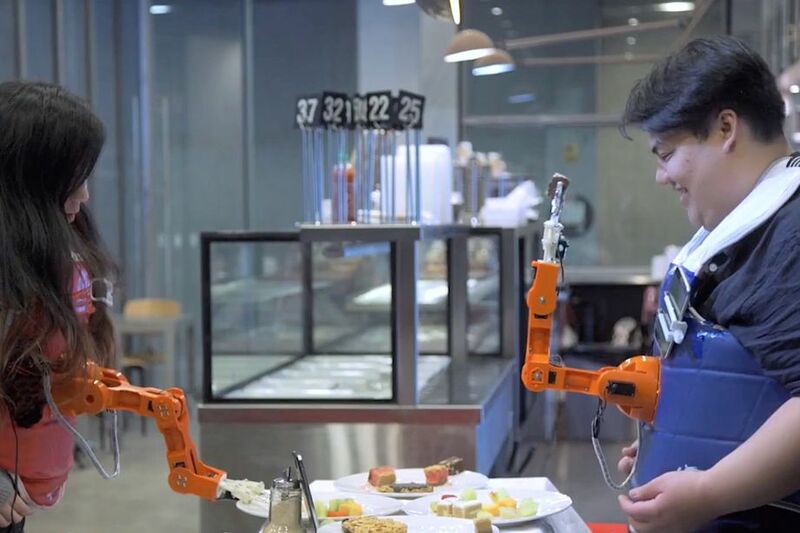 We’ve not reached this gravy-soaked utopia yet, but researchers from Australia and India have taken us one step closer with “Arm-A-Dine” — a robot arm worn in the middle of the chest that picks food up off the table and conveys it to you or your dining partner’s mouth. The intention isn’t to stuff you till you explode, though: Arm-A-Dine is actually a prototype designed to augment the social experience of eating. In a research paper from the Exertion Games Lab at RMIT University in Australia and the Indian Institute of Information Technology Design, researchers explain how most food tech is focused on the preparation of food and not the eating experience. In a world where researchers warn about a “loneliness epidemic” and many meals are taken with smartphone in hand, Arm-A-Dine is supposed to remind us that eating is a social event. But as the paper notes, this weird robot arm really does succeed in making eating a more socially-engaging experience. Testers said using Arm-A-Dine made them nostalgic (“it reminded me of my mother feeding me when I was a child”) and encouraged them to concentrate on eating (“I had to focus [...] in order to pick it up [food] properly”). So remember that next time you sit down to dinner. When your dining partner complains that you really shouldn’t “wave food around the table” or “waggle potatoes in my face,” just tell them “I’m augmenting the social experience of dining,” before silently stuffing your face.